The youth in Africa have been called upon to combat the new forms of slavery and colonization on the continent. This appeal was made by the President of the Episcopal Conference of the the Democratic Republic of Congo (DRC), Bishop Nicola Djomo, at the opening ceremony of a meeting of Pan-African Catholic Youth and Children that is being held in Kinshasa, DRC from August 21-25, 2 015. The Youth in Africa, he said, should not allow false trappings of wealth lure them to move out of their countries in search of non-existent jobs in Europe and America. ” Be vigilant of the deceptions of the new forms of the destruction of the culture of life, moral, and spiritual values. Use your talents and other resources to renew and transform our continent and for the promotion of lasting justice, peace, and reconciliation in Africa. You are a treasure for Africa. The Church relies on you, your continent needs you ” Bishop Djomo emphasized. He further urged the youth to study and understand the Social Teaching of the Church to enable them be of more service to the Church in Africa and their various countries. 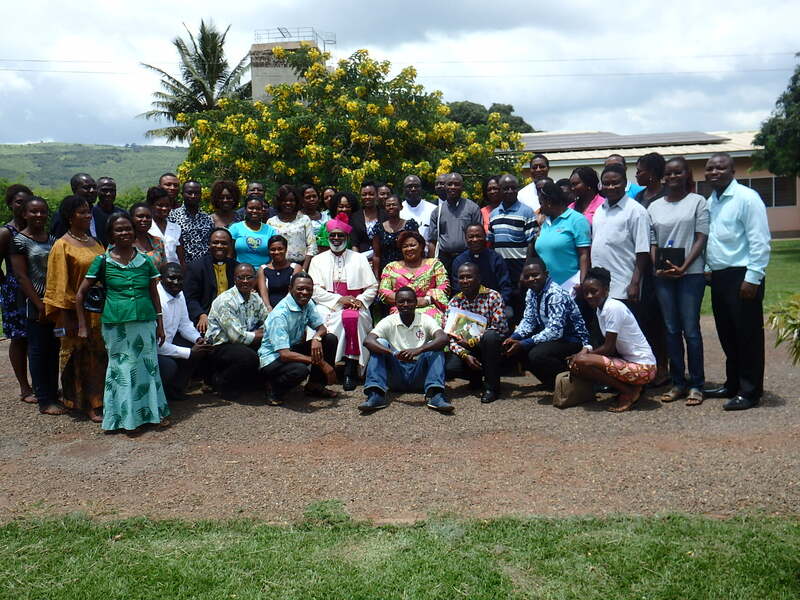 The about 120 participants representing a number of countries in Africa participating in three-day meeting taking place at the Catholic Center of Nganda in Kinshasa were welcomed by an Auxiliary Bishop of the Archdiocese of Kinshasa, Bishop Jean-Poierre Kwambamba. The meeting has been organised by the Symposium of Episcopal Conferences of Africa and Madagascar (SECAM) in collaboration with the Episcopal Conference of Congo (CENCO). In a message presented on behalf of the Secretary General of SECAM, Rev. Fr. Fr. Komakoma, the Director of Communications of SECAM outlined the objectives of the meeting a) as part of preparation towards engaging the youth of Africa in the promotion of Justice, Peace, Good Governance and Reconciliation at the National, Regional and Continental levels; involving the youth in the celebration of the African Year of Reconciliation (from July 29, 2015 to July 29, 2016); b) to institute a Pan-African Organization for bringing together at the continent level Catholic Action Movements for the Youth and Children and c) To consider the possibility of hosting, in the near future, a World Youth Day in Africa. He pointed out that SECAM is giving priority attention to the youth who form about 70 per cent of the population of Africa. ” The youth are therefore the most important sector of the African population on whom the Church ought to count on, as a priority , in the scope of Church’s evangelization’s efforts such as the promotion of justice, peace, reconciliation, and socio-economic development of our continent.” he added. Later in the day Fr. Komakoma in addressing the participants urged them to take charge of their own pastrol engagements with the guidance of their Chaplains. v) Role of the Youth in the Church Today: A challenge for the youth in the Continental Year of Reconciliation. There will be Workshops for coming up with concrete Regional and Continental programmes and projects for the year of Reconciliation and other issues discussed during the five-day meeting. In another development, the participants had the opportunity of participating in a seven-thousand strong Youth Convention of the Archdiocese of Kinshasa that was addressed by Cardinal Laurent Monsengwo of Kinshasa. The Cardinal’s public Catechesis was on the theme: Fraternity, Dialogue, Justice and Reconciliation in reference to Ephesians 2: 12-19 He also answered questions by the youth. The issues raised included that of politics, Church-State relations, economic, social and cultural challenges that are confronting them-the youth. The Meeting on theme: “EDUCATION FOR THE CULTURE OF PEACE AND RECONCILIATION” was coordinated by Rev. Fr. Leonard Sentedi, Secretary General of CENCO and the Secretary General of the Regional Episcopal Conference of Central Africa, Rev. Fr. M. Edouard Mombili.